Soak rice in water for about half an hour and drain out the water completely. Cut the onion lengthwise. Slit the green chillies lengthwise. If you are using coconut, take out coconut milk. Add water and make it to four cups (Coconut milk + water should be four cups). In a pressure cooker, put the ghee and add cinnamon stick, cloves and cardamom and fry little. Add cashew nuts and garlic flakes and fry for a while. Then add chopped onion and green chillies and fry till the onion turns transparent. Add the rice and stir gently till the rice is very hot to touch. Now add the coconut milk + water (4 cups). Add salt and lemon juice and stir well. Pressure cook for two whistle. Serve with any spicy kurma, raita and potato chips. Thank you for your comment. 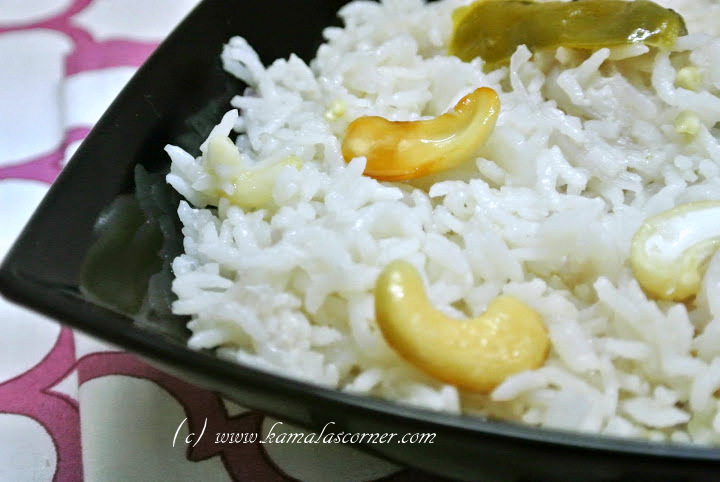 It is very easy to prepare and even children will like it since there is not much spice in this rice. Fantastic recipe, i was trying to do something out of coconut milk since its very good for health being in hottest chennai. thank you very much for the yummy recipe. Thank you for visiting. Hope you will try this recipe and let me know the result. Dear Kamala I am new to this site. all ur recipes are very nice & easy way . I appreciate !it is useful for all. Welcome to my site Kalyani. Thank you for your kind words. We bachelors staying together in Mumbai. We tried few recipes recommended by you including the one Cited above. Its awesome delicious, mouth watering. We sincerely thank you for sharing the above. Keep rocking…:-) Expecting more recipes…. Thank you for your kind feed back and encouraging words.